God was expelled from the public schools in 1962. Many opponents to church/state separation try to claim that God was "kicked out of schools" back in the 1960s — that God was somehow a part of the standard school day in the 1950s and earlier, but in the evil 1960s God was removed. Since then, it is further alleged, every social ill has gotten worse, and the reason for that can be found precisely at the moment when God was expelled from America's public schools. It seems likely that people sincerely believe all of this, but it's not a belief grounded in reality. Perhaps it wasn't all the bungling of the FBI, the CIA and all the other alphabet-soup agencies that didn't prevent the 9-11 attack. Where was God, anyway, on that fateful day? In 1962, he was expelled from the public schools. Since then, we've sought to remove him from various government properties in the name of "religious freedom." The court case which prohibited the state from sponsoring specific prayers in public schools was Engel v. Vitale, decided in 1962 by an 8-1 vote. The people who challenged the laws establishing such prayers were a mixture of believers and nonbelievers in New Hyde Park, New York. The only subject of this case was the authority of the state to write a prayer then have students recite that prayer in an official, organized ceremony. The Supreme Court did not then, nor has it since, held that students cannot pray in school. Instead, the Supreme Court has ruled that the government cannot have anything to do with prayer in schools. The government cannot tell students when to pray. The government cannot tell students what to pray. The government cannot tell students that they should pray. The government cannot tell students that prayer is better than no prayer. Even most conservative Christians have trouble arguing that this is a bad state of affairs, which may be why the real subject of this court ruling is so rarely addressed. One year later, the Supreme Court reached a decision on a related matter, the state sponsored Bible readings which occurred in many schools. The primary case was Abington School District v. Schempp, but consolidated along with it was another case, Murray v. Curlett. This latter case involved Madalyn Murray, later Madalyn Murray O'Hair, thus leading to the impression that atheists were at the center of court cases removing God from public schools. In reality, atheism played a relatively minor role and believers tended to be the central plaintiffs. Once again, the Supreme Court did not then, nor has it since, ruled that students may not read Bibles in schools. Instead, the Supreme Court has ruled that the government cannot have anything to do with Bible readings. The government cannot tell students when to read Bibles. The government cannot tell students what parts of the Bible to read. The government cannot recommend one Bible over any others or discourage use of any particular Bible. The government cannot tell students that they should read Bibles. The government cannot tell students that reading their Bibles is better than not reading their Bibles. So, students have never lost their ability to pray or read Bibles while in school. Students have also not lost their ability to talk about their religious beliefs with others, so long as such discussion is not otherwise disruptive to classes and school generally. 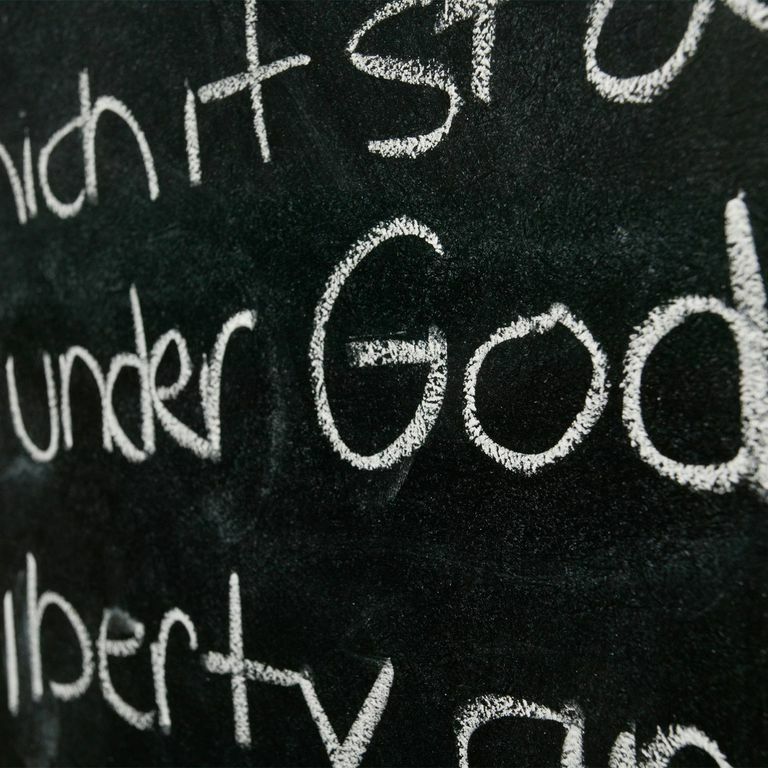 "God" has not been expelled from public schools. If anything has been expelled, it would be government involvement with God — dictating to students what to believe about God, how to worship God, or what the nature of God is. This is an appropriate expulsion because those are inappropriate actions on the part of school administrators and state employees. However, it doesn't sound nearly so bad or inflammatory to complain that "government sponsored religion" or "government written prayers" have been expelled from public schools. On the contrary, this more honest statement about what happened could make strict church/state separation even more popular, exactly the opposite goal of conservative evangelicals found repeating the above myth. So one should wonder why any those doing the complain seem to want our government to write prayers, sponsor prayers, endorse Bibles, or any of the other things which those infamous cases in the 1960s stopped. Was Madalyn Murray O'Hair to Blame for Taking Prayer Out of Schools? How Can Schools Recognize Holidays?